The Siemens-Betriebskrankenkasse SBK is one of the largest corporate health insurance companies in Germany, and is one of the 20 largest statutory health insurers. It was founded in 1908 and now has more than one million insured customers with around 1,600 employees at over 100 locations. SBK was already using Confluence. The new Linchpin intranet was to support the company, above all, throughout the process of targeted corporate culture changes. To meet this requirement, changes were planned to improve the cooperation within the organization parallel to the technical relaunch of the intranet. The focus was to promote an open work culture, improve the usability of the system to ensure employees were happy to use it in their daily work, and to minimize the effort that users spent to communicate wth each other. We also needed to standardize the systems, so that administration was easier and updates were available faster. Design: The customized Confluence theme matches the corporate design of the company and is visually familiar to the users. In addition, several improvements were made to enhance user friendliness, and additional functions were provided to make it easier for employees to use the intranet as a tool for everyday work. Global navigation: The employee portal provides global navigation, which can be tailored to specific user groups. This allows users to access relevant information and content from anywhere with a click. Personalized App Center: Through the App Center, every user can directly access the web-based tools that are important and useful for them in their day-to-day business. The intranet thus serves as a central entrance point to the personally relevant tool landscape. Enhanced user profiles: The new social intranet provides extended user profiles, which can be further expanded at any time with many additional fields. In particular, these fields are used to implement a company-wide expert search. Employees can also get to know each other better, network with each other and, if necessary, find the right professional contacts easily. News channels: Corporate news on the intranet's homepage can be customized according to the role and location of the users. 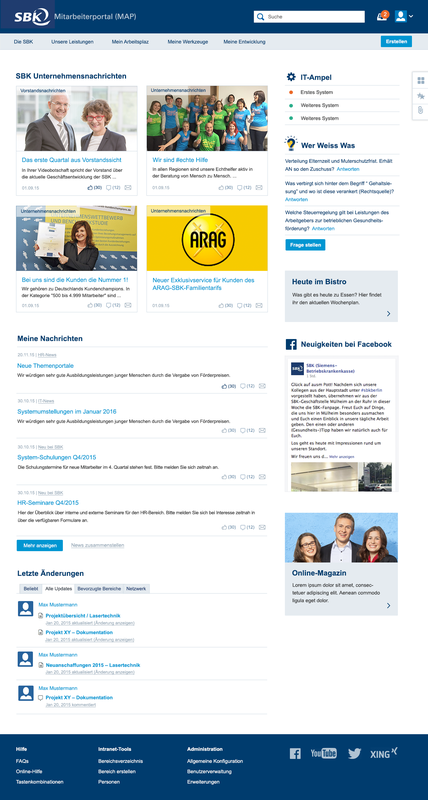 Users can create their own customized news feeds from different news channels within the intranet - such as IT support, the employee blogs, etc. - to automatically provide themselves with a feed of interesting information and to stay up-to-date. News can be shared within the user's location, and also across the company.